Status: Finished | Genre: Humor | House: Games! Narrator: The lonely man almost fell off the pier. It was a cold, freezing winter day and the lonely man was sitting on the edge of the pier feeling sorry for himself because no one liked him. Narrator: Suddenly, something started to rise out the water. Monster: On behalf of my planet, I is going to burn you and eat you. Lonely man: Aaaaaahhhhhhhh, who the are you? Monster: I can not tell you but I think now I am going to eat you. Narrator: The ugly, frightening monster crawled upon the pier. Narrator: The man screamed so hard that the monster lost his hearing and the lonely man fell off the pier into the freezing water. Monster: What has just happened? Narrator: The old man pulled himself on the pier and began to run and scream at the same time. Lonely man: Ahhh, don’t, eat, me, pleaseeeeeeee!!!!!!! Monster: What did you say? Lonely man: I said don’t eat me. Monster: I can’t hear you. Monster: Anyway, I feel hungry so i'm going to eat you. Narrator: The lonely man continued to run around screaming while the deaf monster tried to eat him. Narrator: An hour later, the lonely man tired out the monster so much that he flopped to the ground. 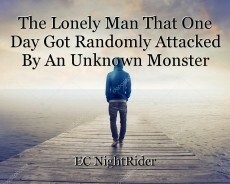 Lonely man: Yes, take that you horrifying monster! I knew that I would tire you out but i'm hungry. Narrator: The lonely man gave the monster a hearing aid. Monster: How can you afford that? I thought you were lonely poor? Lonely man: Thats what everyone thought because I dressed up as a lonely man. I am actually the 7th richest man in the world. Now I am going to eat. Monster: Don’t eat me! Please! Lonely man:Why would I eat you? You’re poisonous and you would probably taste like rotten eggs. I’m just gonna leave you their for the rest of your life you despicable,weak, hideous monster. Narrator: The monster became a lonely monster and he was left their on the pier till the end of his life without anyone noticing. © Copyright 2019 X-XCXlToEuNdTSAtTiInOgNer-. All rights reserved. HAahahha. Amazing sense of humor!